In the middle of a workday in the middle of last week you could find a crowd of people gathered at Lake Mary to witness a rare sight; the spillway was overflowing. To non-locals this might sound like a ridiculous reason for celebration, but in this dry climate we tend to get excited about water and this year we’ve seen more of it than usual. 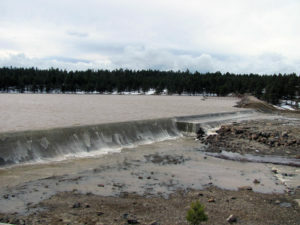 According to Meteorologist, Lee Born, as of the last day of February Flagstaff had passed 150% of its annual total for the water year which begins in September. The snowfall total for this winter is 10 inches above the average. 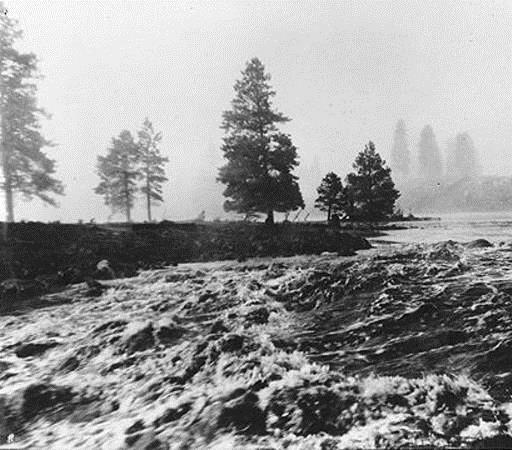 Following a severe drought in 1897 and 1898 that caused the death of hundreds of head of livestock and raised great concern among people in the Flagstaff area, Timothy Allen Riordan decided he would build a dam to ensure water for the Arizona Lumber and Timber Company as well as for livestock. In 1904 he began building the dam and named it and the lake it created after his eldest daughter, Mary. In 1918 the lake flooded as you can see in the image below. 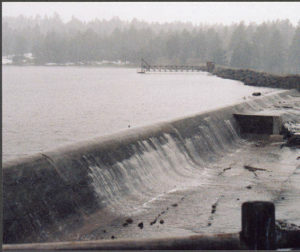 Later the lake was stocked with fish and it became a popular recreation area. In 1935 the Arizona Lumber and Timber Company gave the land and the lake to the U. S. Government so that it could remain a public recreation facility. 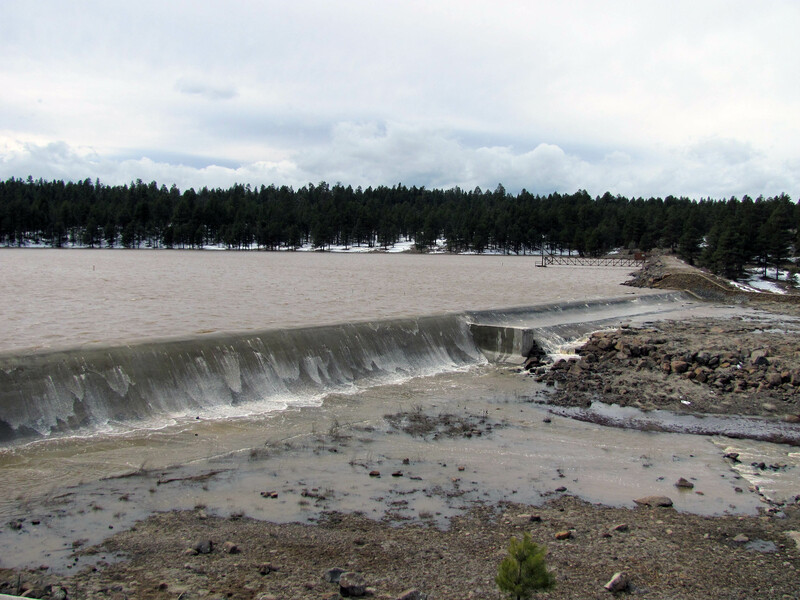 Today the surface water collected from Lake Mary represents the second largest source of Flagstaff’s water supply. According to the City of Flagstaff, 2.7 billion gallons of water are used by our citizens in a single year. The Lake Mary water treatment plant is capable of treating up to 8 million gallons of water per day. The last time Lake Mary overflowed its spillway was more than a decade ago during the winter of 2004-05. Check out the photos below that compare the spill over in 2004-2005 with the flow last week.